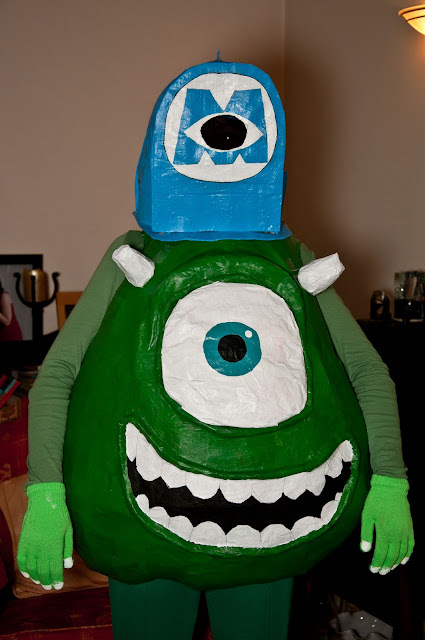 Pop Culture Costumes: Fully Built: Mike Wazowski! Step 1: Take your Mr. Potato Head costume from last year's Halloween ball. 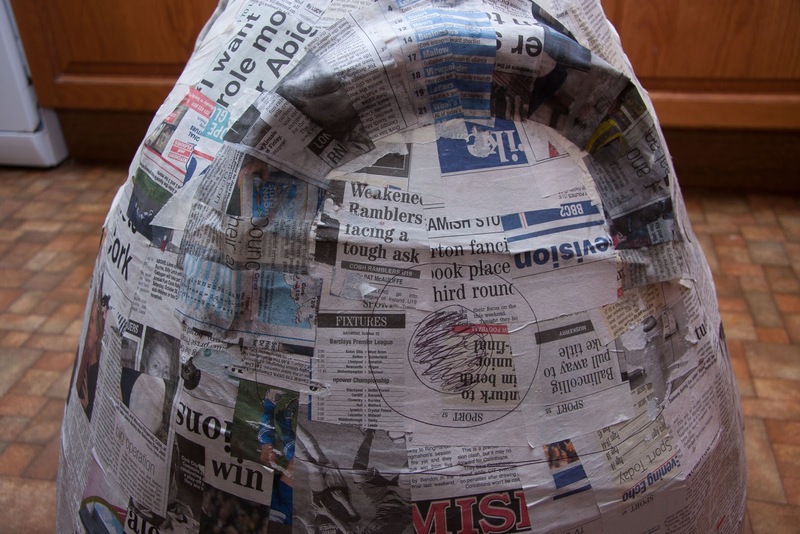 Given that the above was our first actual step towards building this costume, it makes this post tricky in terms of making it a full instructible article. Last year, my girlfriend Ciara decided to continue the Halloween Pixar theme she had begun a year previously (having crafted a portrayal of Guido from Cars) by creating a Mr. Potato Head costume. This year, the decision process was a little more laborious as we struggled to come up with a good idea between us. 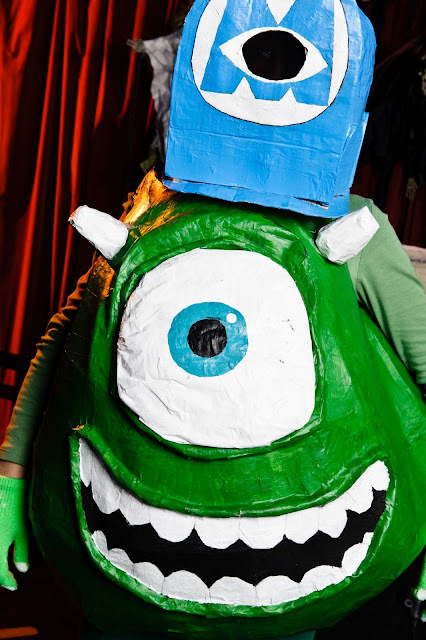 That was until eight days before Halloween, when Ciara decided to further perpetuate the now traditional Pixar theme by constructing a Mike Wazowski costume. 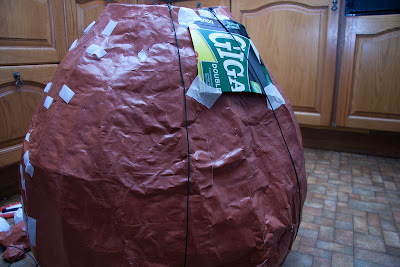 Initially we agreed that applying papier mache to an exercise ball would be the best way to create the body. 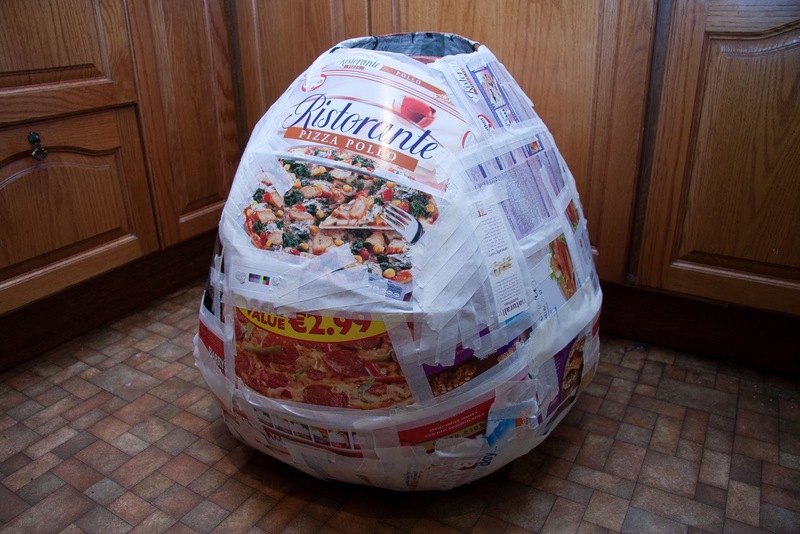 However, upon finding other costumes that were constructed in this way, we were underwhelmed by the results. Moreover, it made us realise that Mike is not a perfect circle, so using an exercise ball is an inherently flawed approach. He's more of an egg shape, which would make his construction a little trickier. My mind raced back to the construction of Mr. 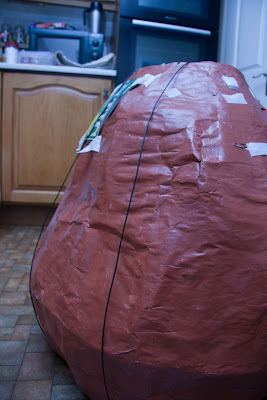 Potato Head's body, which was created from scratch during a sometimes arduous process of wire framing. Given how close we were to Halloween, I wasn't sure we had the time to repeat this process with Mike's construction. Then the thought hit me - could Mr. Potato Head's body be used as a base for creating Mike? The idea for reusing Potato Head had been pitched to me a few weeks earlier, when I was figuring out how to create the body for my own costume. I didn't think it was quite right for that purpose, but felt that it was potentially a good fit for Ciara's Mike costume. We took the somewhat beaten Mr. Potato Head from the attic (it had endured a tough time on its night out a year previously) and my hopes were dampened a little: this would need a lot of work. However, as Ciara tried it on, I started to form a mental image of Mike's features imposed onto the bruised and dented papier mache construct. I started to believe that this really would work after all. I was positively giddy when we finished this step, because it was like a different construct. 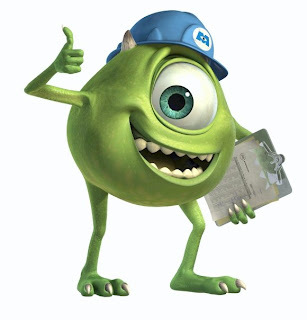 It was becoming increasingly easy to visualise Mike's puffy eyeball centred on the front, where Mr. Potato Head's removable features lay a year previously. To make the eye itself, Ciara cut out a circular piece of cardboard (measured against the diameter of the eyelid she had created). 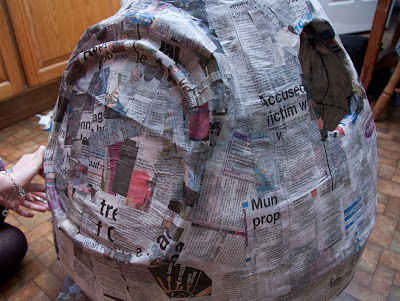 This was stuffed with newspaper and covered over with masking tape, before having its own layer of papier mache applied (his horns were made in the same way). It was then put aside until the body was painted, before ultimately being attached with velcro. For his mouth, we first drew a pencil outline of where it should be (made easier by virtue of having his eyelid in place). 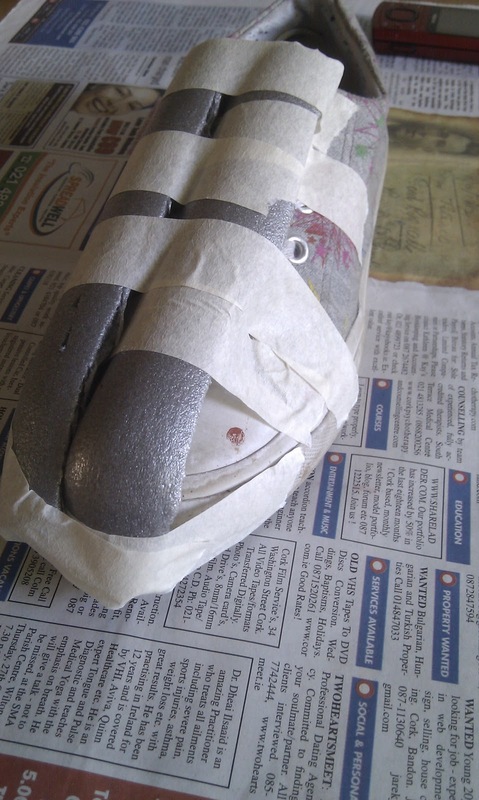 Ciara then created lips using the same method as that used for his eyelid; he was ready for painting. While Mike was being painted, we were able to get to work on the other elements of the costume. Part of this involved a shopping trip to get a green top, pants and gloves. It appeared to be impossible to find a consistent shade of green across all apparel items, but ultimately I think this limitation was lost among the rest of his detail. After the shopping element to the build, we had to get to work on one further piece of crafting: his feet. We created the feet using a similar method to that which I used for my Alien feet 3 years previously. Using an old pair of runners that were deemed expendable, we attached pieces of copper wire insulation to create the texture for his feet. 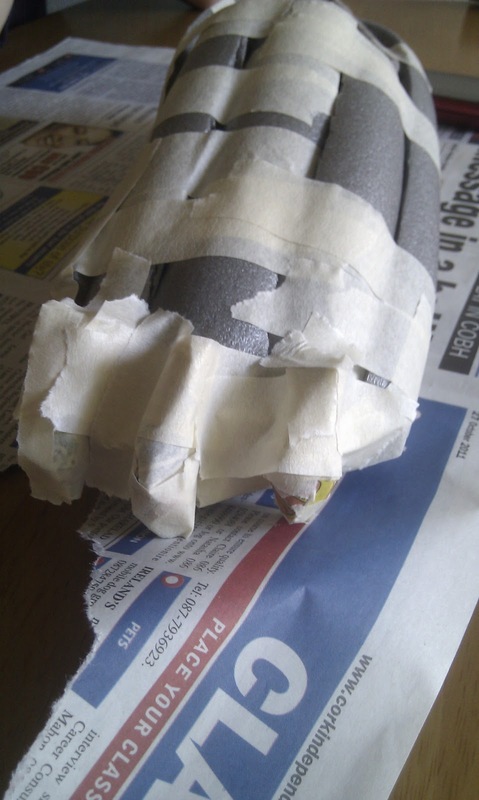 The toe-nails were then created from crumpled pieces of newspaper pulp, moulded to shape and taped on. Once the basic shape of each foot was created and held together with masking tape, a layer of papier mache was applied to solidify them. 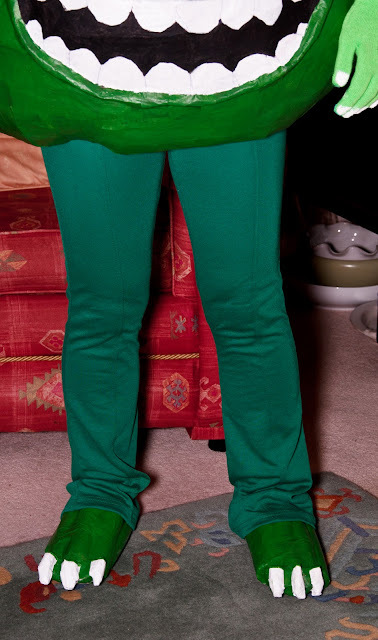 Each one was then painted using the same shade of green as the body (with the toe-nails painted white). The next order of business was Mike's factory hard hat. Ciara wanted to strike a balance whereby her head wasn't sticking out of the body all night (possibly reducing the impact of the costume) but at the same time not being couped up in something restrictive all night. With these criteria in mind, we decided to use the same method as we had for Mr. Potato Head: create his hat with a subtle window for seeing through. It was tricky to get the proportions of the hat right; an obstacle that also had to be negotiated for the costume's predecessor (we ultimately had to turn Potato Head's bowler hat into a top hat). The reason for this was that the hat had to be big enough to cover an entire human head. Earlier on in the process we thought we had a solution; put the arm holes further down the body, which would in turn raise the body a few inches up so that Ciara was only peering out the top. This way, we would only have to make a hat big enough to cover half of her head. Ultimately, however, this plan was doomed to fail because 1) The body got progressively wider from the top to middle, which meant that the arm holes would not rest on Ciara's shoulders, and 2) the body would be too far raised, making the legs look all wrong proportionately. Ciara was shortlisted for Best Costume, so we got to share the stage together which was fitting. While the Mayor ultimately took home the prize, it felt like a victory for us both given how collaborative the process of both costumes was.